The Hunter Area Trail Coalition (HATC) formed in 2016 out of the Kaaterskill Rail Trail (KRT) committee with the intent to share ideas, coordinate trail planning projects and leverage resources that build upon the vision of creating a cohesive town-wide trail network that connects public and private lands for year-round outdoor recreation. KRT volunteers at the Phase 1 opening. The original KRT committee formed in 2009 after the Mountaintop Community Resource Strategy was completed. The committee prioritized the former Ulster & Delaware railroad line between the Mountain Top Historical Society and Kaaterskill Falls on NYSDEC land as its first trail project. The committee worked with the New York-New Jersey Trail Conference, property owners, the Town of Hunter, and NYSDEC to open this pristine, undisturbed stretch of the U & D Railroad as a public hiking trail. The Kaaterskill Rail Trail (KRT phase 1) opened in 2013 after years of planning and fundraising. Developing the former rail bed into a public trail had been envisioned over many decades and thanks to the dedication of residents, not-for-profit organizations and government agencies, the trail officially opened on National Trails Day in June 2013. 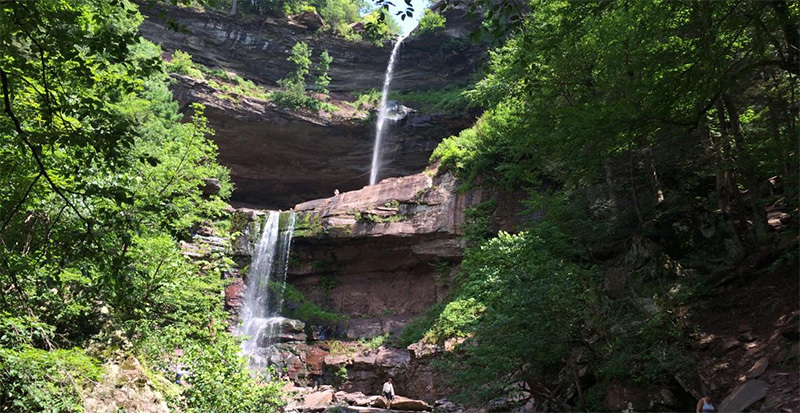 It offers amazing views of the popular Kaaterskill Falls and provides an important link between the Mountain Top Historical Society and the facilities at the NYS North South Lake campgrounds, dispersing visitors and relieving traffic congestion along Rte. 23A. The KRT committee wasn’t stopping there, however. They expanded their planning efforts partnering with other local organizations on future trail extensions to the KRT that would extend west to the Village of Hunter. The newly-formed trail committee, the Hunter Area Trails Coalition (HATC), is now well underway with implementing a multi-phase network of trails throughout the Town of Hunter. When phase 1 of the KRT was initially opened in June 2013, there was a detour along North Lake Road. In May 2017 the trail opened with a direct route along the historic railbed from the Mountain Top Historical Society and phase 1 was complete. One can access the Kaaterskill Rail Trail (KRT) phase 1 from trailheads at the Mountain Top Historical Society in Haines Falls and the bottom of Laurel House Road, above Kaaterskill Falls. The 1.5 mile trail goes through three private properties and land owned by NYS Department of Environmental Conservation (NYSDEC) in the 8,550-acre Kaaterskill Wild Forest. The rail trail leads to many other trails on NYSDEC land around the popular North South Lake State Campgrounds including the Escarpment Trail, the former site of the Catskill Mountain House and a trail around South and North Lakes for leisurely strolls. It roughly follows what was originally a footpath dating back to the 1820s that connected the Catskill Mountain House to hotels in Haines Falls. When it originally opened in 2013, a detour around one property was necessary. The KRT committee raised $120,000 to purchase the final piece of property, completing phase 1 entirely on the rail bed. The Open Space Institute, the NY-NJ Trail Conference, and the Mountain Top Historical Society funded the purchase, and the Hunter Foundation covered the soft costs leading to acquisition. On May 20, 2017, there was another community celebration marking the end of the 2013 detour and the opening of the missing link. Walkers and hikers can now enter the KRT along the old train route at the historic train station. This long-awaited achievement was made possible through a broad coalition of agencies and individuals. On both sides of the KRT is the Mountain Cloves Scenic Byway, the first state designated scenic byway in the Catskill Park. To the north is North Lake Road (County Route 18), which leads to the North South Lake State Campground, and to the south is State Route 23A, the gateway to the northern Catskill State Park. 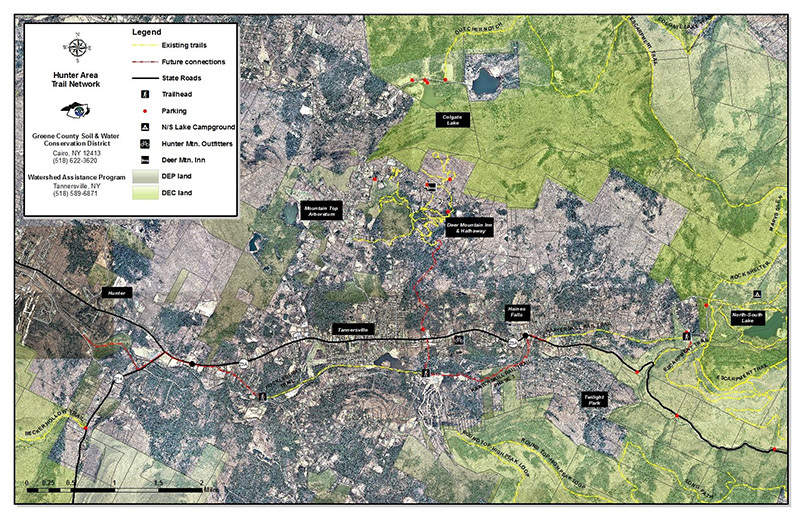 Examples of existing and proposed trail development within the Town of Hunter. Since forming in 2016, the HATC has advanced extensions of the KRT. 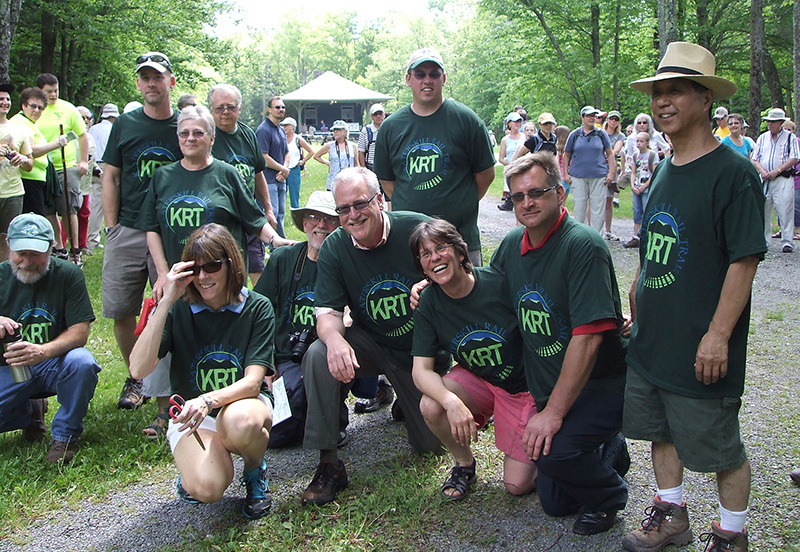 KRT phase 2 is on New York State land in the Kaaterskill Wild Forest. Following the success of opening Phase 1 on the former railroad bed, the NYSDEC took the lead in planning upgrades to the trails in and around Kaaterskill Falls to make access safer and more manageable. 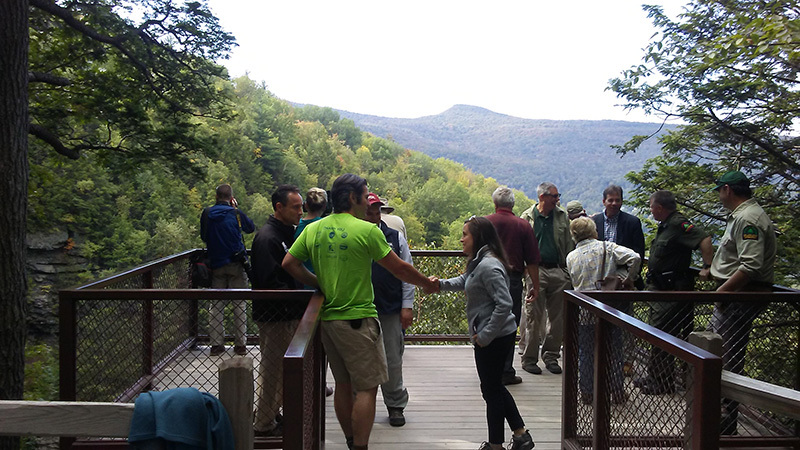 The NYSDEC invested over $800,000 in safety and accessibility improvements including: 1) installing a 115-foot pedestrian bridge over Spruce Creek above Kaaterskill Falls on what was once a carriage trail that brought tourists to the Hotel Kaaterskill and Catskill Mountain House, 2) constructing a new foot trail leading from the end of the marked Kaaterskill Falls trail at the base of the falls upslope to the middle pool of the falls, 3) installing a stone staircase designed to blend in with the natural stone of the area at a location that limits its visibility from below, 4) expanding two parking areas, 5) constructing an observation platform overlooking the top of the falls and 6) building new, wide, smooth surface trails with level resting areas. A celebration was held on September 13, 2017 at the top of Kaaterskill Falls to promote trail safety during the busy hiking season. Over 125 people attended including state, county, and local officials, as well as numerous trail and regional organizations. 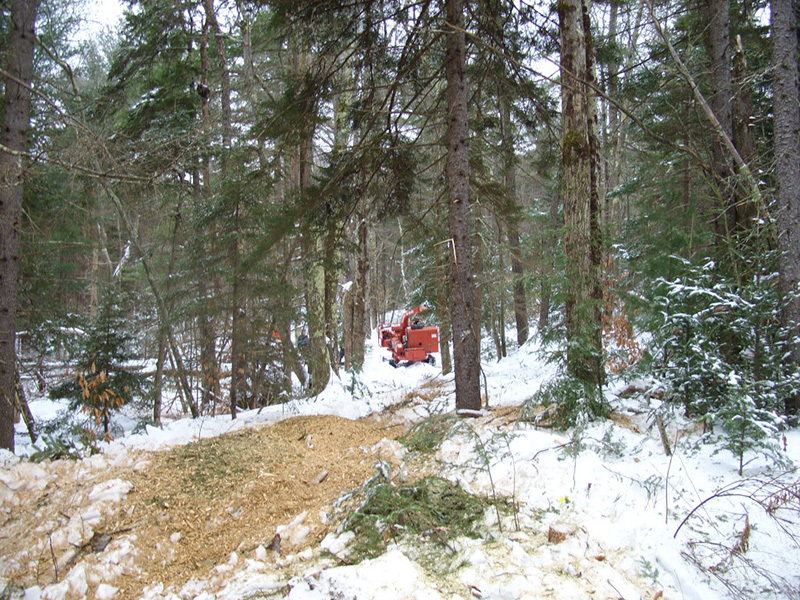 KRT phase 3 extension – this phase has now connected the Mountain Top Historical Society in Haines Falls west to the Huckleberry Multi-Use Trail in Tannersville. Four landowners have agreed to the allow the trail and pedestrian access agreements have been executed with the Town of Hunter. The Town of Hunter was awarded a $75,000 NYSDEC Smart Growth grant to complete Phase 3 and market and advertise the growing trail network in the town. Work has begun in January 2019, with a hoped for completion by the end of the year. KRT phase 4 – this is another stretch of the former U & D Railroad that remains intact for the most part. This phase would require a long pedestrian bridge over the Schoharie Creek at the former electric light dam. The bridge would require extensive permitting and fundraising. An alternative is to work with NYSDOT on designating State Routes 214 and 23A as share the road with pedestrians. KRT phase 5, the Hunter Branch Rail Trail – is the last segment on the west side that connects Route 214 to Dolan’s Lake in the Village of Hunter. The trail is being developed on the former Hunter Branch of the Ulster and Delaware Railroad, which was originally built as a narrow gauge railroad from Phoenicia on the Delaware & Hudson line from Kingston. Work began at the Phoenicia end in 1881 completed a year later to the Hunter terminal. 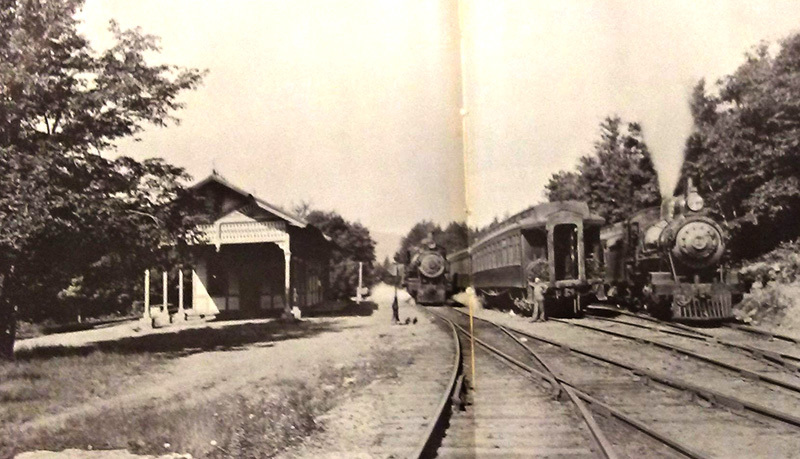 The railroad from the beginning had a profitable freight business from the numerous saw mills and furniture factories in the Stony Clove Valley to the south and Hunter Village, then a commercial hub for the industries and farms in the upper Schoharie Valley. 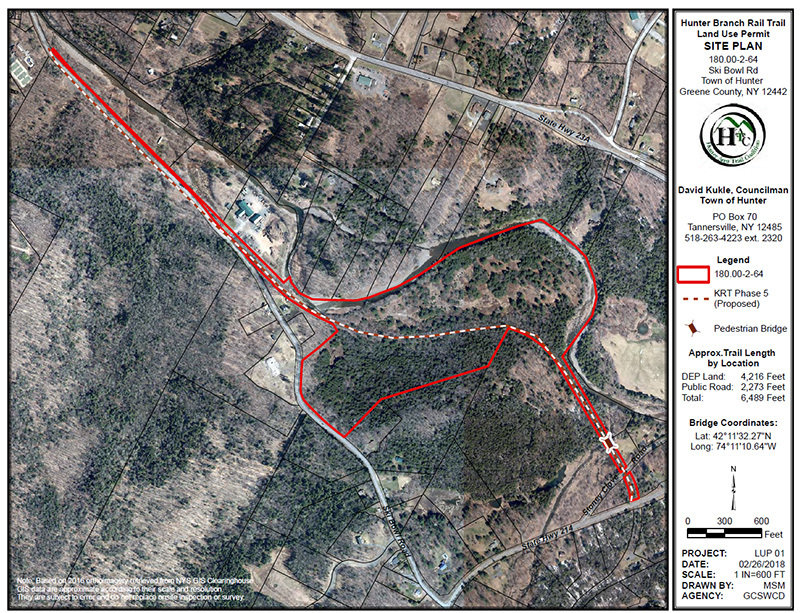 New York City Department of Environmental Protection currently owns the parcel with the rail road going through it and is willing to grant a land use permit to the Town of Hunter once requirements are met. The total length of phase 5 is 1.4 miles before connecting the Village of Hunter at Dolan’s lake. Proposed bridge location along KRT Phase 5. 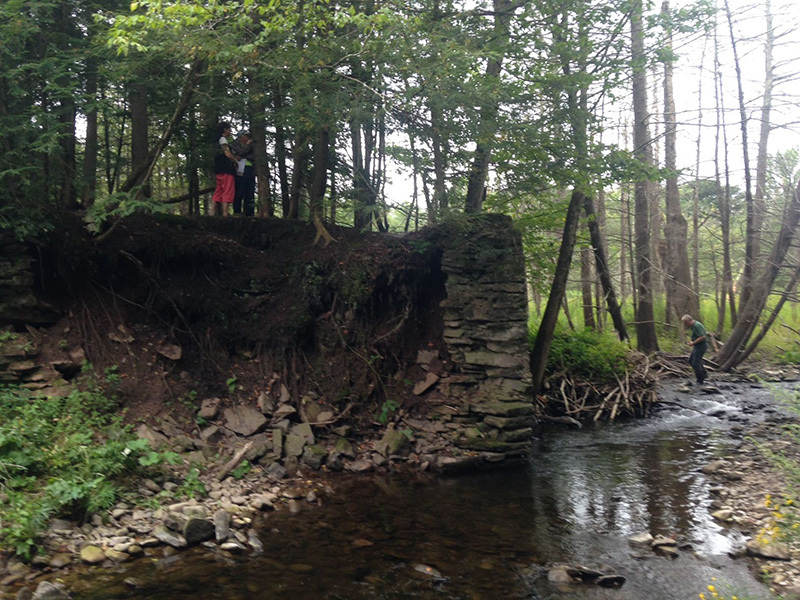 A pedestrian bridge is needed for this phase to span a small tributary to the Schoharie Creek. The HATC has estimates for engineering, prefabricated bridges and installation, the cost estimated around $120,000 and is applying for grants in 2019. With much trail development happening in the region, the Hunter Area Trail Coalition (HATC) formed in 2016 to coordinate trail projects across the Town of Hunter. Representing local government, state, city and county agencies and local not-for-profit organizations, the HATC plans and collaborates on trail projects that enhance hiking opportunities within the town. Participating members include Catskill Center for Conservation and Development, The Hunter Foundation, Greene County Soil & Water Conservation District/Watershed Assistance Program, Mountain Top Arboretum, Mountain Top Historical Society, NY-NJ Trail Conference, NYC Department of Environmental Protection, NYS Department of Environmental Conservation, Town of Hunter, Village of Hunter, Village of Tannersville, and Windham Area Recreation Foundation. 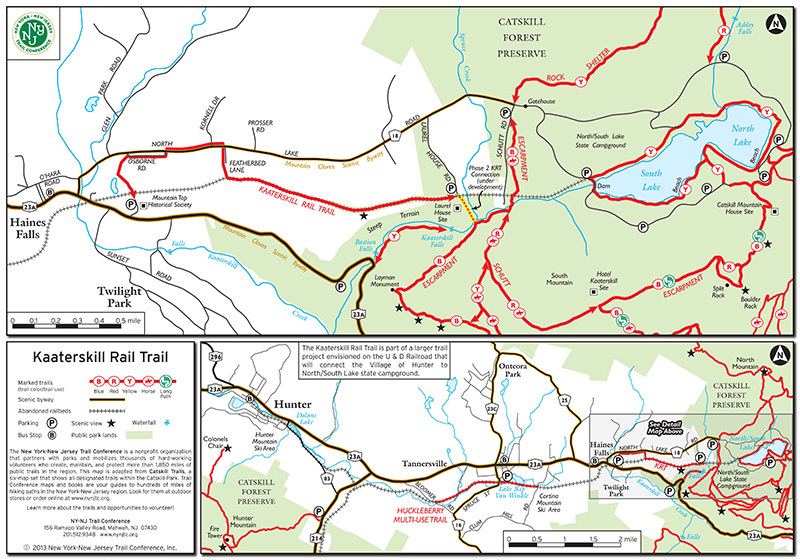 The Hunter Area Trail Coalition’s vision is to connect nearly 10 miles of trails through public and private lands from Kaaterskill Falls and the New York State North South Lake Campground to the Village of Hunter creating a cohesive trail network throughout the Town of Hunter and its two incorporated Villages, Tannersville and Hunter.